Everyone deserves a dazzling smile, and our team can craft the perfect look to complement your facial features and personality. You shouldn’t have to settle for a less-than-stellar appearance -- so share your ideal vision with us, then let us put our expertise and artistry to work to create the smile of your dreams! Call our Frisco office to schedule your appointment today! We warmly welcome patients from Stonebriar Park, West Plano, and The Colony to learn more about cosmetic dentistry. These days, orthodontic treatment doesn’t have to mean submitting yourself to the hassle and potential embarrassment of metal brackets and wires. 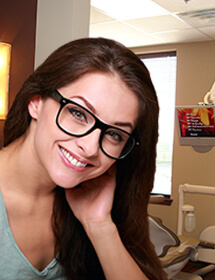 With discreet options like Realine, New Horizons Dental can help you achieve the straighter teeth you desire -- without everyone knowing you’re wearing braces. People with minor crowding and small gaps in their front teeth benefit from the invisibility of Realine, which uses clear, plastic aligners to gradually shift teeth into the preferred position. Over time, your teeth can yellow or become dull… but professional teeth whitening can give you back a beaming smile. With our new Zoom! Advanced, we use a special light to activate a strong, yet safe teeth whitening gel, and teeth typically become six to ten shades whiter in a single visit. It is safe, fast and effective. We also offer take-home trays for patients who prefer that option or want to touch up their Zoom treatment at home. Ask about our $285 teeth whitening special. Our patients looking to reveal whiter, dazzling teeth quickly -- perhaps in preparation for a big event, like a wedding -- can benefit from the rapid results of an in-office whitening treatment. New Horizons Dental prefers the Zoom! Advanced Whitening system for its fast, efficient results. With this incredible system, you can walk into New Horizons Dental with dingy, dirty teeth…and walk out just one hour later with a smile that shines up to eight shades brighter! Zoom! Advanced Whitening works pretty simply, really. To reveal your whitest smile, we cover your lips, cheeks, gums, tongue -- everything except your teeth with a heavy-duty covering. Then we apply the high-powered bleaching gel to your smile and activate it under a special UV light in 15-minute intervals. After just three light applications, the results are in -- and you’ve got the stunning smile you’ve always dreamed of! To help you maintain your wonderful Zoom! Advanced Whitening results, we’ll advise you on a few things you can do to avoid staining -- like staying away from highly pigmented foods and beverages. We’ll also send you home with a touch-up whitening kit to keep your smile sparkling for longer between treatments. Maybe you’d like to reveal your results more gradually, from the comfort of your living room. If that’s the case, you’ll be excited to know we offer an alternative to rapid in-office treatments. With a professional at-home whitening kit, you’ll apply the whitening gel to your custom-fit mouth tray and wear it for about half an hour each night. You’ll likely notice results after the first treatment, with full whitening complete after two weeks! Restoring teeth from cavities used to require marring your smile with silver, or amalgam fillings -- an unattractive solution that required removal of a significant portion of the natural tooth. Fortunately, those noticeable restorations are now a thing of the past! Using white or tooth-colored composite resin, Dr. Hara can now restore your teeth after decay with a beautiful, natural-looking filling that blends flawlessly with the rest of your smile. White fillings require less preparation meaning more of the natural tooth stays intact. Metal fillings can hide further decay and damage, which can lead to significant problems later on. Although amalgam has been ruled as safe for use in the mouth by the FDA, many patients appreciate the fact that there’s absolutely no risk for mercury exposure with composite resin. Tooth-colored fillings aren’t just used for restoring teeth from decay, either. They’re also very good at correcting small cosmetic imperfections in the teeth, like chips, stains, fractures and slight gaps or misalignments. Known as chairside bonding, it’s a wonderfully affordable alternative to other, more costly cosmetic treatments. Patients who are in good oral health, free from tooth decay and gum infection, are usually excellent candidates for porcelain veneers. The treatment for porcelain veneers is completed in about two visits to Dr. Hara’s office. In the first, you’ll discuss your smile goals and she’ll put together your unique treatment plan based on your desires. (It can help to bring in magazine clippings and photos of what you do and don’t want your smile to look like for this portion.) Then, your teeth will be prepared for the veneers and you’ll receive temporary devices to wear until the permanent devices have been crafted. Once they’re ready, you’ll come back to New Horizons Dental for the final bonding -- and then you start your life with a new, dazzling smile! Having your teeth restored after serious decay or damage shouldn’t leave you feeling self-conscious about flashing gold or metal every time you smile. With all-ceramic restorations, it doesn’t have to. We can rejuvenate your dental health and beauty with a sturdy, natural-looking ceramic crown, bridge, inlay, onlay or veneer…so all you or anyone else ever notice once the restoration is complete is your healthy, attractive smile. Ceramic is a material that looks, acts and feels just like your natural teeth -- but its advantages don’t stop there. All-ceramic restorations are only about as abrasive as tooth enamel, so they don’t cause unnecessary wear on surrounding teeth. And if your gum starts to recede in coming years, an all-ceramic restoration won’t show a dark line at the top of your tooth like those constructed of porcelain fused to metal may. Caring for your all-ceramic restoration isn’t all that different from caring for the rest of your teeth. Take care when eating crunchy or sticky foods, and never use your teeth to open packages. Brush and floss daily spending extra attention on removing leftover particles from the ceramic device -- and don’t forget to visit your dentist as recommended, too.